Retro: FLAME AMPLIFICATION AND A BETTER HI-FI LOUDSPEAKER? WE LIVE IN an era jaded by science’s seemingly routine discovery of basic phenomena-coherent light and the laser; superconductivity and the super-cold realm of zero resistance; weightlessness and its impact upon space electronics. And now, flame amplification. 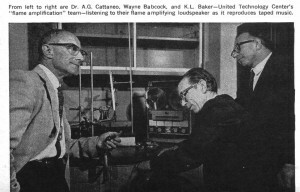 “Flame which behaves physically and electrically like a high-fidelity loudspeaker … and has inherent amplification besides,” explains Dr. A. G. Cattaneo, manager of United Technology Center’s Sunnyvale, Calif., Physical Sciences Laboratory, and one of flame amplification’s three co-discoverers.